I have been recently working on SugarRecord 2.0 and one of the things I tried to do for that version was making it easier for contributors to clone the project and start contributing with it. I realized a few months ago that Carthage and ReactiveCocoa had a folder called script with a set of normalized scripts. I cloned these projects, executed the script bootstrap there and I had the project ready to contribute with. Wow! that’s awesome. Developers don’t need installing dependencies like Fastlane, Bundle Gems, … Scripts are implemented using bash. Setup task turns into just one line of code in your console. You can build all your project shared schemes and use that build script for CI. If you’re working on Xcode projects, no matter if they’re a company project, an open source library, whatever.. Add them in your project and leave a comment in the README.md explaining how to use them (very straightforward). Where does the idea of normalized scripts come from? This idea comes originally from Github. It was a few weeks ago when googling, I found this blog post from the GitHub engineering team. They realized that thereis a set of repetitive tasks on any project that could be normalized in scripts. 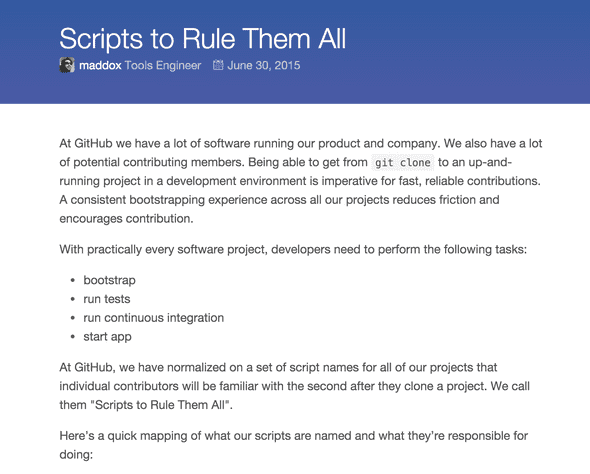 The decided to stanrdize these scripts and call it Scripts to Rule Them All. What a brilliant idea. Thanks GitHub for the idea and @jspahrsummers for creating the equivalent version for Xcode projects.